ALL NEW!! 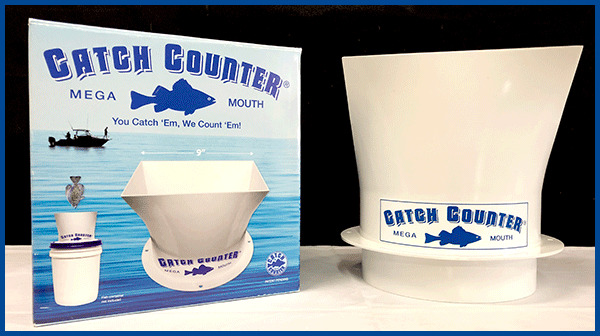 MegaMouth CatchCounter – AUTOMATICALLY Count Your Catch!! INTRODUCING THE ALL NEW MegaMouth CatchCounter! Our latest version of CatchCounter is named "MegaMouth" and for good reason. Our past models included "The Original" and later "BigMouth". Both were great models for panfish but we saw a need to count larger fish such as Slab Crappie and Monster Gills. White Bass and Walleye. MegaMouth features a 60% larger chute opening that will handle large Crappie, Perch, Gills, Trout, Bass, White Bass, Walleye or anything fitting the Chute! MegaMouth is molded of tough ABS Plastic. Cleanup is now a snap! MegaMouth features a user-adjustable spring tensioner to set the resistance of the counting flap. Adjust for the type of fishing you do! 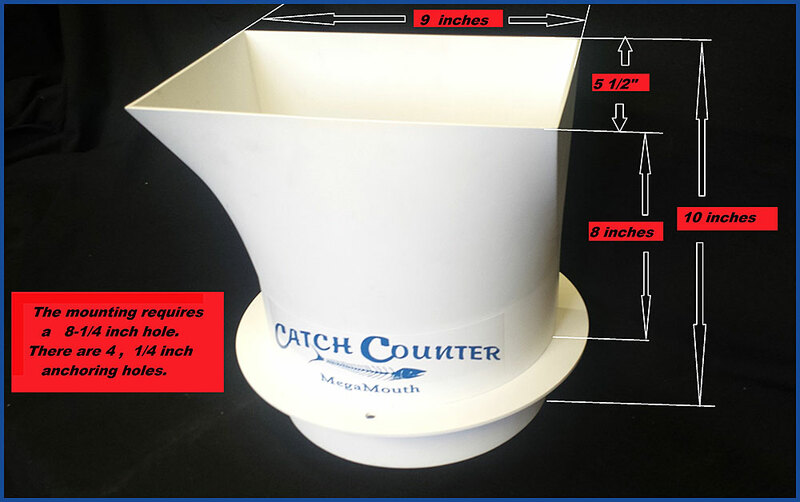 CatchCounter LLC is a company that manufactures and markets devices used by fishermen to help keep a count of fish caught. These devices are built modular to allow the owner a choice of where and how to mount. 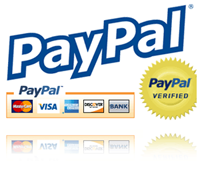 Most mounts are on a cooler or bucket lid but can mount on any type of flat surface. Mounting hole dia. is 8 1/4". A 60% larger throat and chute than BigMouth. A user-adjustable return spring tensioner that allows for variable counting flap resistance. A new injection-molded design for strength and quick easy cleanup.